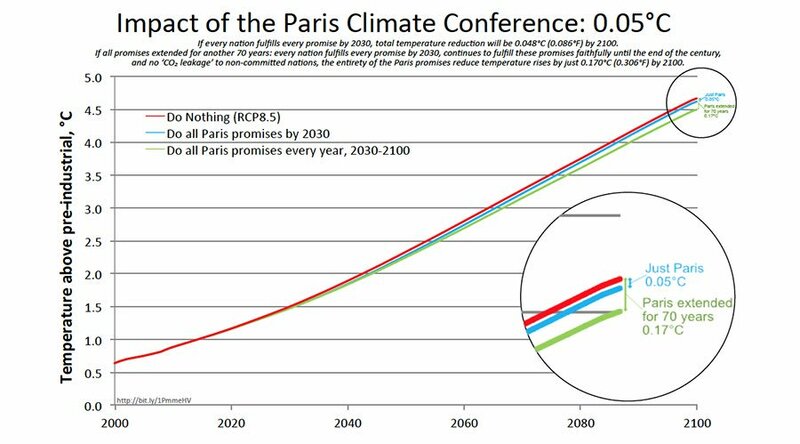 In fact, based on the UN's phony projections, the Paris Agreement wouldn't make a dent in the alleged problem, even if every government and tyrant actually obeyed the pledges — something no serious person expects to happen anyway. And so, rather than crush American industry, prosperity, and liberty for no reason, analysts declared that Trump was right and justified to announce earlier this year that the U.S. government would withdraw from the illegal pseudo-treaty. According to a press release put out by the dictators club about the UN Environment Program’s Emissions Gap Report, even if every government and tyrant that signed up for the Paris regime were to actually obey, it would represent “only a third of what is needed to avoid worst impacts of climate change.” The UN's scaremongering report proceeded to advocate massive government spending — $100 per “ton” of CO2 — on “reducing emissions,” as well as on additional UN schemes that would purport to force governments to ban or subsidize various things. The report's fretting about “tons” of CO2 fails to mention that human breathing alone is responsible for many millions of tons of CO2 emissions every single day. “As things stand, even full implementation of current unconditional and conditional Nationally Determined Contributions makes a temperature increase of at least 3 [degrees Celsius] by 2100 very likely — meaning that governments need to deliver much stronger pledges when they are revised in 2020,” the press release about the UN's report continued, complaining about the prospect of the U.S. government following through in withdrawing from the scheme. In response, the UN report demands that more wealth be extracted from taxpayers to subsidize cronies in economically non-viable “green” energy. Leading UN bureaucrats echoed the sentiments, sounding like doomsday cult preachers selling snake oil. “One year after the Paris Agreement entered into force, we still find ourselves in a situation where we are not doing nearly enough to save hundreds of millions of people from a miserable future,” speculated UN Environment Program (UNEP) boss Eric Solheim. “Governments, the private sector and civil society must bridge this catastrophic climate gap.” The report was released as governments and dictatorships gather in Bonn, Germany, for another round of “climate” negotiations. The UN, obviously, intended its latest round of teeth gnashing as a way of terrorizing humanity into giving up even more liberties and prosperity. Ironically, though, leading climate commentators turned the tables, pointing out that the UN had inadvertently confirmed what critics of the UN and the Paris Agreement have been saying all along: It's beyond useless, and regardless of one's view on climate, it cannot possibly be worth the price. Pointing to various charts, graphs, and data, Delingpole also highlighted the fact that the Communist regime ruling China and the government of India both pledged to continue increasing their CO2 emissions while Obama illegally pledged to practically suffocate the U.S. economy by slashing CO2. Having growing emissions from China and India of the “gas of life,” as scientists refer to CO2, is just fine, of course. In fact, many leading scientists say increased CO2 will be a major benefit for humanity and the planet. But if one accepts the UN's debunked hypothesis, the whole Paris scheme would seem to make little sense. Of course, the UN's latest admission is hardly the first time that even the most fanatical man-made global-warming theorists have ridiculed the Paris Agreement as useless at best. Indeed, even under the UN's most rosy projections, the alleged diminution of “global warming” that would result from the scheme amounts to a rounding error, in a best case scenario. And plenty of alarmists have noticed it, too. More cautious and skeptical believers in the man-made global-warming theory have exposed the fraud, too — using the UN's own numbers and calculations! Danish statistician Dr. Bjorn Lomborg, the president of the Copenhagen Consensus Center, for example, crunched the numbers by assuming — almost certainly inaccurately — that the UN's long-debunked “climate” models were valid. What he found makes a complete mockery of the alarmist cause as well as apologists for the UN's “climate” regime created at Paris. Others have produced similar findings. Researchers at the Massachusetts Institute of Technology, for instance, compiled the pledges made by governments and tyrants as part of the UN's “Paris” scheme, then compared the result with their own preexisting projections. They found that even assuming the warmist theory was correct, the Paris scheme would reduce temperature by some 0.2°C by the end of the century — a number too small to even properly measure at the global level. When they used UN Intergovernmental Panel on Climate Change (IPCC) projections from 2000, the researchers found no improvement, period. And for that, Americans are supposed to suffer trillions in lost prosperity, not to mention the lost liberty. Unfortunately, despite the impression given by much of the fake news-peddling establishment media, President Trump has not technically exited the UN's Paris Agreement yet. In reality, the pseudo-treaty, having never been ratified by the U.S. Senate as required for all treaties by the Constitution, is legally meaningless. But practically speaking, Obama's illegal so-called “executive agreement” has not yet been formally repudiated, meaning the bureaucracies could conceivably continue implementing its provisions. Republican voters, less than one fourth of whom even believe the man-made global-warming theory, must remain involved in exposing the scam.